Christmas is just around the corner and even if you’re not very religious it is still a very pleasant holiday. As we get older we forget to have fun but these easy Christmas crafts for kids are suitable for older people as well and may even be good party games. Here are some ideas for cool, diy crafts that you could do at home that are cheap, if not free, that will turn all parents into a regular Martha Stewart and your kids will love you for it. These are the best easy Christmas arts and crafts for all kids (or the kid in all) around the world. 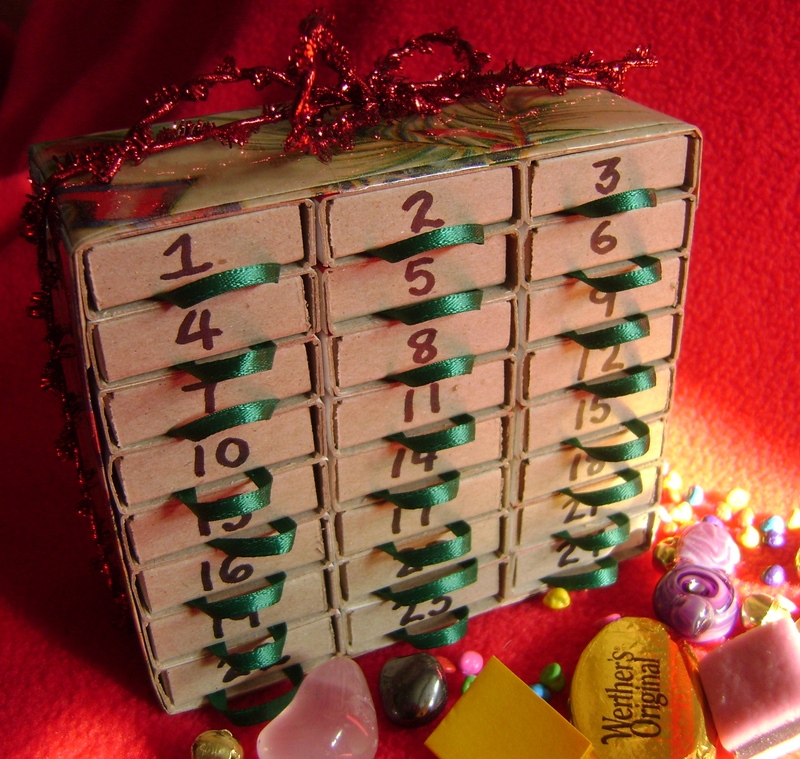 This calendar starts as a little chest with 24 drawers filled with small gifts. When all the drawers will be removed and reversed the chest will reveal a picture. Remove the matches from 24 boxes of matches. Glue together the matchboxes in three stacks. Wrap a strip of paper around the glued matchboxes to make a chest. Paint numbers on the front of each of the drawers. On the back of the chest paint a tree or any other design you wish. Remove the drawers from the chest and glue on their underside a small ribbon on the end with the number. Cut a square from construction paper and glue it to the back of the chest to keep the drawers safe and hide the picture on the back. Glue the piece of construction paper at the edges. Fill the drawers with candy and little notes and put them back into the chest. Twist together three pieces of pipe cleaner of around 5 inches to build a snowflake and add another one and a half inch piece on each point of the snowflake. Tie it to a pencil with the use of some string. 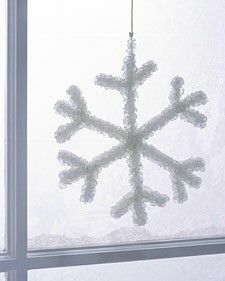 Find a jar big enough to hold in the snowflake without it touching the sides. Fill the jar with 3 tablespoons of borax and a drop of blue coloring for a cup of boiling water. Let the snowflake sit inside the jar overnight and then remove it. This is an easy and quick craft for younger children. They will have fun decorating this simple Christmas stocking for their favorite teddy or doll or to put it on the Christmas tree. Glue the decoration to the sock and leave the sock to dry. Put it on the mantelpiece or Christmas tree and fill the sock with treats and sweets or use it for your favorite doll or teddy. 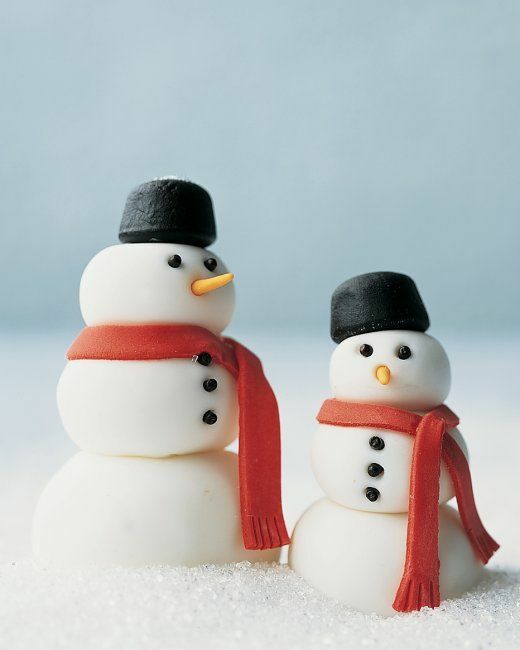 This happy snowman is a cute ornament and is also edible. On a flat surface dusted with cornstarch roll white balls of fondant of three different sizes to make parts for the snowman. Color a tiny amount of fondant orange with the gel paste food coloring. Use the same coloring to color red a small bit of fondant to make a scarf for the snowman. Make holes with the toothpick for eyes, buttons and nose. Push in the carrot and sprinkles into the holes. Add a scarf to the snowman and use licorice as hat. Put them on a platter with homemade cookies that has been sprinkled with sanding sugar to look like snow. Build more snowmen to have more ornaments for Christmas. Paint the cup red and the ball pink and leave out to dry. Glue the bottom of the cap to the ball. Cut two hands from pink foam and arms from the red one. Glue them together and onto the body. Make a belt out of black foam and glue it around the middle. Make a hat by rolling some red felt around a cone. Glue it around the top of the ball. Cut a stripe of white felt and glue it around the hat. Put a pom pom at the end of the hat. From white felt cut a beard and glue it on the front of the face. Add a red pom pom as nose. Glue two wiggle eyes and draw a mouth. 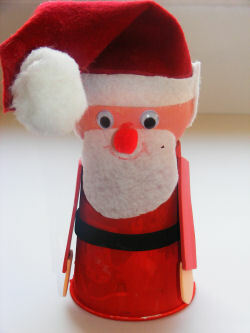 So there you have it, you can turn inexpensive things into art projects with these Christmas craft ideas for kids.